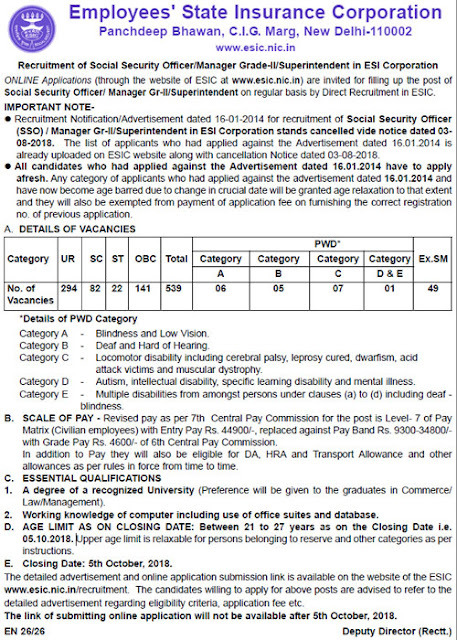 Recruitment Notification/Advertisement dated 16-01-2014 for recruitment of Social Security Officer (SSO) / Manager Gr-II/Superintendent in ESI Corporation stands cancelled vide notice dated 03-08-2018. The list of applicants who had applied against the Advertisement dated 16.01.2014 is already uploaded on ESIC website along with cancellation Notice dated 03-08-2018. All candidates who had applied against the Advertisement dated 16.01.2014 have to apply afresh. 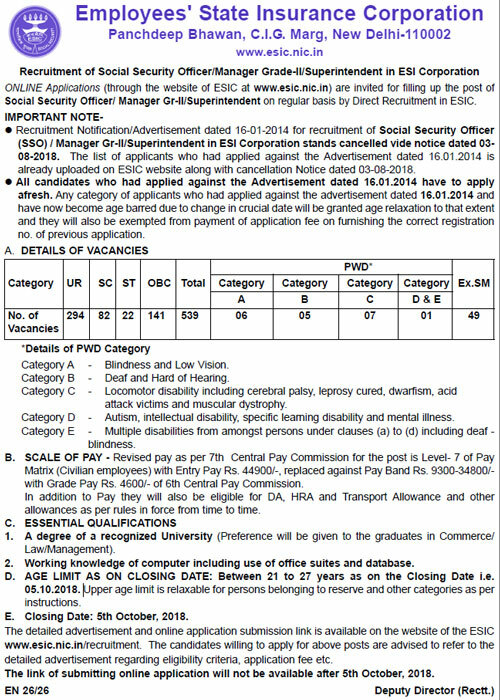 Any category of applicants who had applied against the advertisement dated 16.01.2014 and have now become age barred due to change in crucial date will be granted age relaxation to that extent and they will also be exempted from payment of application fee on furnishing the correct registration no. of previous application. SCALE OF PAY - Revised pay as per 7th Central Pay Commission for the post is Level- 7 of Pay Matrix (Civilian employees) with Entry Pay Rs. 44900/-, replaced against Pay Band Rs. 9300-34800/-with Grade Pay Rs. 4600/- of 6th Central Pay Commission. In addition to Pay they will also be eligible for DA, HRA and Transport Allowance and other allowances as per rules in force from time to time. 1. A degree of a recognized University (Preference will be given to the graduates in Commerce/ Law/Management). D. AGE LIMIT AS ON CLOSING DATE: Between 21 to 27 years as on the Closing Date i.e. 05.10.2018.